From Atlanta, this is a totally demented album which should appeal to fans of weird psychedelic groups. 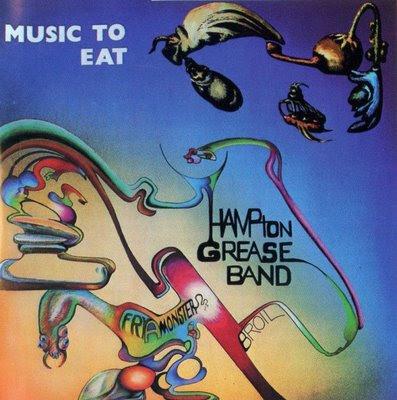 The Hampton Grease Band somehow managed to sign a contract with Columbia and released Music To Eat, a double album which seems to have had one of the worst sales in the Columbia history. It was "produced" by the group with David Baker and contains only seven long tracks: Halifax, Mario, Six, Evans, Lowton, Hey Old Lady and Hendon. Hampton screams, whispers, sings, a la Captain Beefheart or Far Cry, while Kelling and Phillips explore various styles of guitar, from jazz, blues and rock to oriental music and freak out experiences. The lyrics are really weird, even including the reading of the label of a paint tin. The gatefold sleeve is strange too and mentions that "the people pictured here have complete control of the North American Continent at this very second"! Ptolemaic Terrascope magazine would later release two live tracks by the band on one of their free 45s.